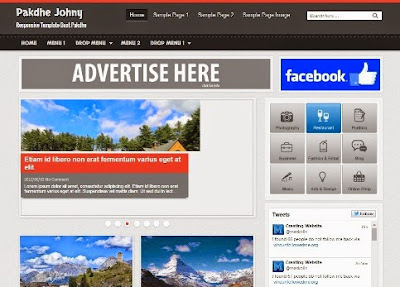 TemplateHack.com - Download Pakdhe Johny premium blogger template. After long time no share, I will share super responsive blogger template, Pakdhe Johny. Pakdhe Johny is a customizable blogger template from Mas template, Indonesia. This template made in gallery style blogger template. This blogger com template designed with 3 column. It’s great template for your magazine blog, personal blog, portal and gallery blog. Pakdhe Johny have a black and white color blogger template, related post with responsive thumbnail in every post, beautiful header and footer designed responsive and mobile friendly, floating social bookmark, SEO optimization for your Google page one rank. Have three column footer and one right sidebar. Hiearrky heading like H1 and H2 ready for more SEO and visitor organic search engine to your blog. Aaah, so many features and benefit you can get if you use this html blogger templates to your blog. I really recomended this templates!